Today: a blog post that is suspiciously similar to some of Lexikaliker’s blog posts. 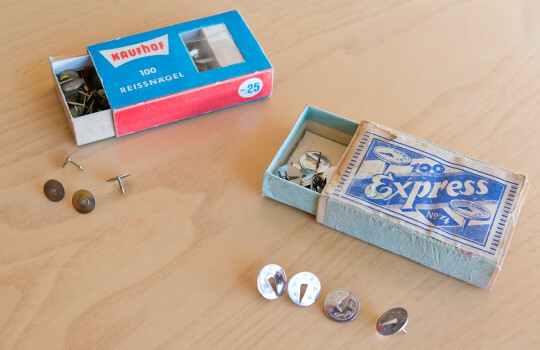 But I just cannot resist showing these drawing pins I found in a shelf my father used to use. Sorry, no close ups. The camera I have with me has a fairly wide lens and the minimum focus distance is rather large. This picture has already been heavily cropped. Kaufhof is a department store chain in Germany. The Express box contains drawing pins marked “Gloria 44”. I’m not sure whether these are the drawing pins that were originally sold in this box, as I don’t see the word Gloria anywhere on the box.